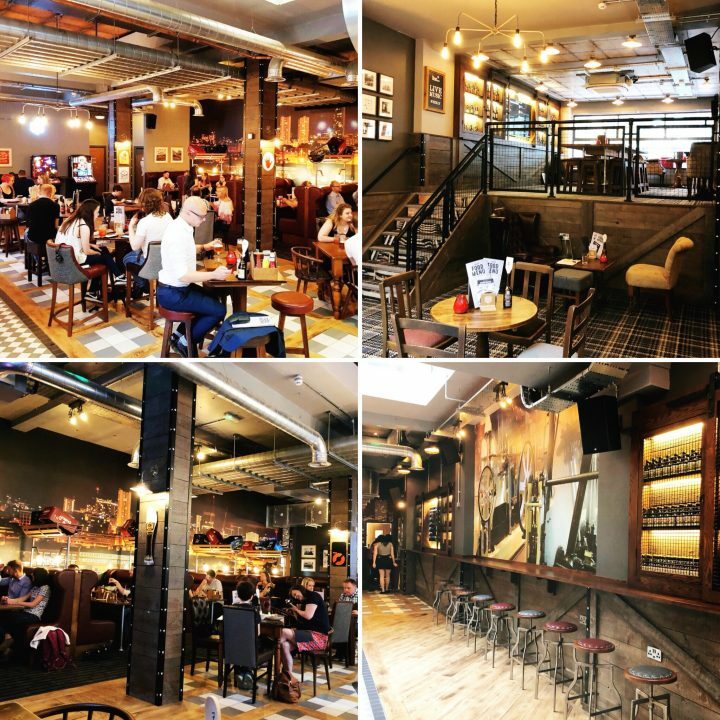 This week I was invited along to the preview night at The Head Of Steam, a new bar in Temple St, Birmingham that opened yesterday The Head of Steam are a group of bars owned by Camerons Brewery. 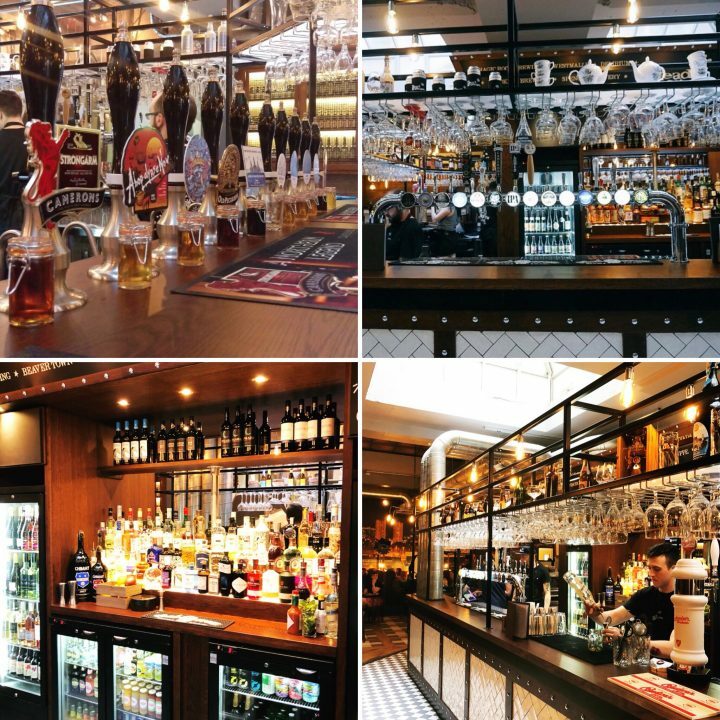 Until recently the bars were mostly situated in the North East and Yorkshire. 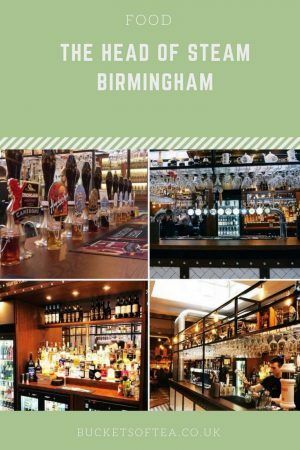 The opening of the Birmingham venue along with bars in Leicester and Nottingham see the company moving further south and I can honestly say this is a great move as Head Of Steam have brought something special to Birmingham. As you enter the bar at street level there a tables with plenty of space between them. 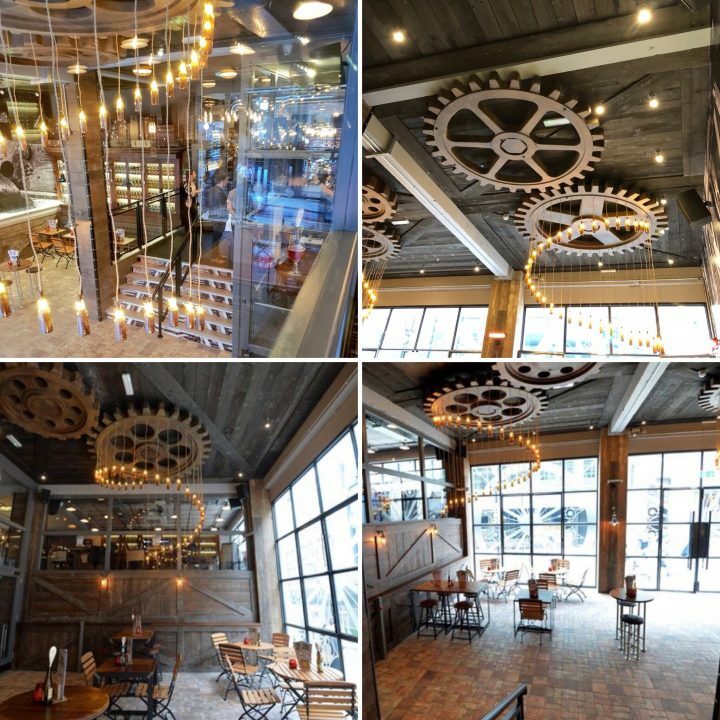 The bar is decorated in an inductrial theme with huge cogs and hanging copper lights. Up a small flight of stairs (disabled lift available) there is more seating and in the centre of the room is the stunning well lit bar that has a lovely modern glam feel to it. In front of the vast array of cask beers are little mason jars with a sample of each bear in to enable you to see if it’s a dark or pale ale. Samples were offered before a decision was made. This is what real ale pubs do so well. There is also another seating area on a slightly higher level overlooking the entrance. This is ideal if you want a to hire a private area for business or celebration. I really liked how much space there was between each table, too often you go to a bar and you are sitting right on top of the other people there. There really is so much space which I can see on a Friday or Saturday night really fillimg up with drinkers as well as diners. 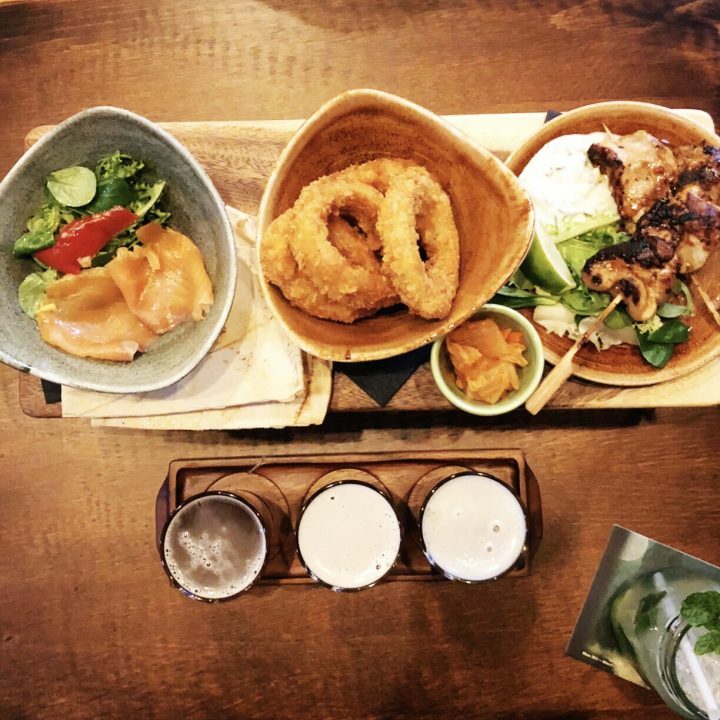 For starter we choose The Besler which was a choose of three light bites with a sampler of three perfectly matched beers. Priced at £14.95 it was great value. 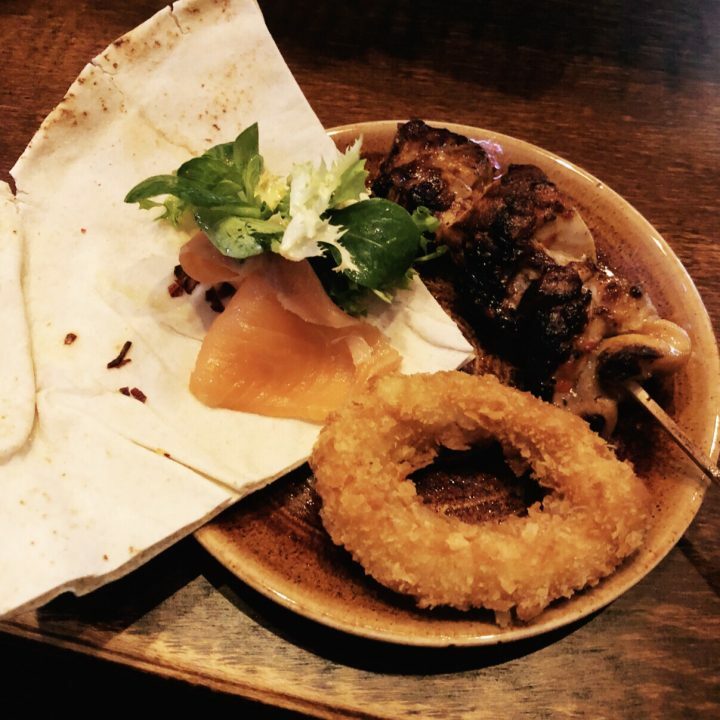 We picked the Yuzo, Ginger & Shiso Smoked Salmon with chilli flay bread, Korean-Inspired Squid and the Chicken Churrasco Brochette Skewers. Each of the light bites were adequate portions and could quite easily have stretched to three people sharing. Although the food was spiced it was just the right amount of heat. I’m not a beer drinker but the three chosen beers; Belgium Blonde and India Pale Ale were perfect accompliments. 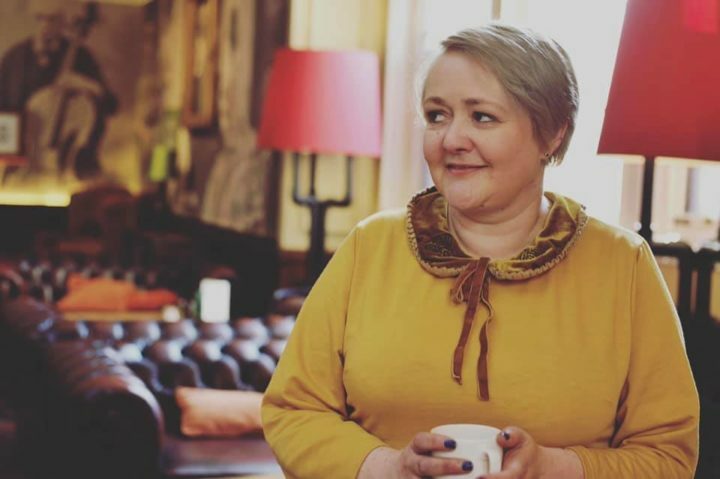 If you are a regular reader you will know I’m a cocktails girl. I don’t really like the taste of alcohol which is why I like cocktails as a real cocktail should never taste of alcohol but should pack a punch. I tried two cocktails throughout our meal; a mojito and a Cherry Lollipop. Both were delicious with the mojito being spot on, a good hit of mint and ice cold. The second cocktail, the Cherry Lollipop is one I has not tried before and I just loved. Image the flavour of a glace cherry in a drink form and that’s exactly what you have! The cocktail menu boasts 20 different cocktails and 5 beer cocktails. All are priced at £7.95 and compared with other venues in Birmingham these are excellant value for money. 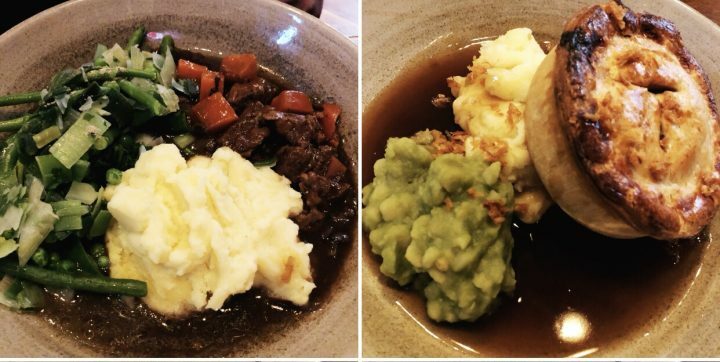 For mains we picked the Beef Bourguignon (311.95) and the Steak & Ale pie (£9.95). 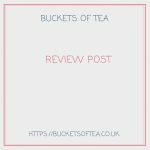 Both were served in bowls with the most creamy mash which was perfectly seasoned and ladles of gravy. The pastry on my pie just melted in the mouth. This pie was made by a human, no machines involved here and it showed in the taste! The Beef Bouguignon tasted like it was delivered straight from France and the accompanying vegetables were cooked perfect. 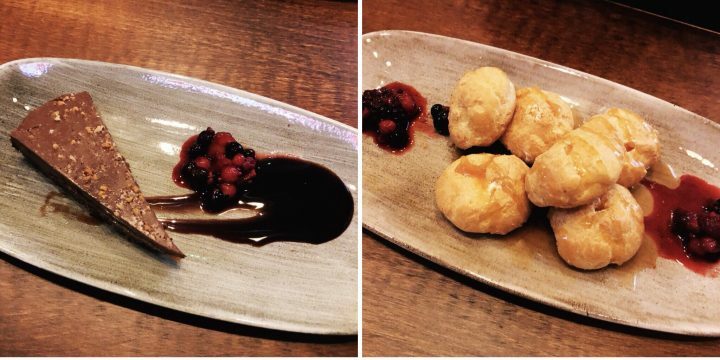 There was a lovely choice of desserts, this is the Profiteroles and Salted Caramel & Chocolate Torte. Both were delicious and unlikesome pub deserts weren’t overly sweet. Perfect dishes to round off this amazing meal. I’d like to thank the staff for a great evening. They were so attentive and knowledgeable about all the food, cocktails, ales and beers available. 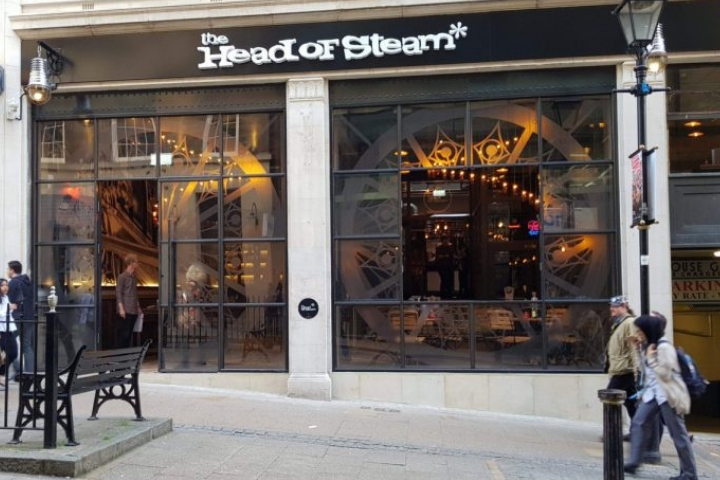 The Head Of Steam is certainly a welcome addition to Birmingham City Centre and I can see this being a great place for not only shoppers and office staff for lunch but also after work drinks and a great venue for a night out with friends in Birmingham. With such an array of cask ales and craft beers plus food suitable for vegetarians and bvegans Head Of Steam is bound to be a hit. Their full menu can be found here and the drinks menu is here.